Let’s get the important stuff out of the way quickly. I technically did not eat a whole pig. There were a few pieces that I didn’t eat. Where I fell short was mostly in the digestive tract area. I mean there are only so many places where you can get chitterlings, and I did not come across any in my travels this year. I also did not consume a specific area of the pig that is found only on males. Not because I wouldn’t, but because again, I couldn’t find any reputable dealer of piggy privates in NYC. So much for being able to get anything in this city. Even though I technically am a pig eating slacker, I still consider my “Year of the pig” a success. My goal was to take something that I love (pork) and get out of my comfort zone. There are so many cultures where they use every single part of the animals that they kill. In the US, we tend to be very wasteful and throw away a lot of great cuts (and sometimes keep the leaner, less flavorful ones). This little experiment was an education for me. I learned that pig trotters (feet), when prepared by April Bloomfield of The Breslin (recipe here), can be one of the most delicious dishes in the world. I learned that kidneys, when “deviled” a la Fergus Henderson, can make a great little breakfast dish. I learned that headcheese is an acquired taste, that I have not fully acquired. I learned that pig brains, smothered on crusty grilled buttery bread, taste like you would expect brains to taste (not my cup of tea). Most of all, I learned that there is no better way to have a great party and foster a communal spirit than to roast a whole pig with 30-40 of your closest friends and relatives. 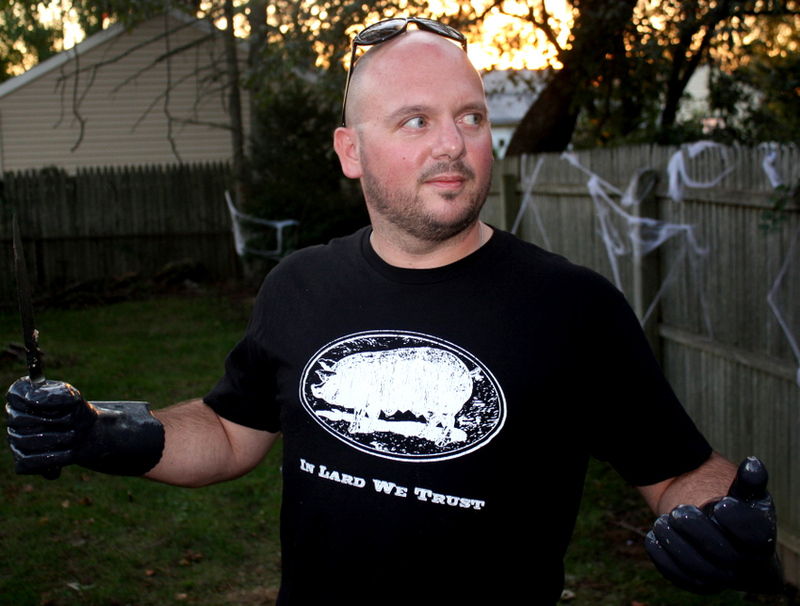 In fact, the greatest thing to come out of this silly little year-long task was the pig roast co-hosted by @mikeypiro . This is something that we WILL do every year from now on. Food is an important way that we all relate to one another. It has always been a communal experience, and I think that it is important that it stays that way. I’m not going to make a sweeping resolution this year saying that I will never eat alone, but I do resolve to try to always share a meal whenever possible. Now, if anyone knows where one can procure some piggy sexual organs in the tri-state area, please let me know. We are still proud of your efforts my friend. You #justabout ate the whole thing. I’m curious as to what 2012 will bring to your table.